The “beauty” of the 45 reefer container concept is obvious: This ISO reefer unit, diesel-electric or with other refrigeration systems matches the size of a reefer truck. 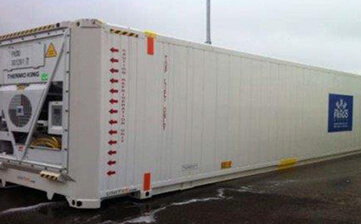 As a matter of fact, the 45 intermodal reefer container is a large standardized shipping container, designed and built for intermodal freight transport, meaning these containers can be used across different modes of transport – from ship to rail to truck – without unloading and reloading their cargo. These units are “rail friendly” and adequate for its use in “short sea” services. Likewise they can be transported in platforms for container haulages. 45 reefer units can be easily handled, moved, and stacked, and that will pack tightly in a ship or yard. Intermodal containers share a number of key construction features to withstand the stresses of intermodal shipping, to facilitate their handling and to allow stacking, as well as being identifiable.